First, let me apologize for my long silence on this blog. I strongly desire to make writing a habit, but during the past few months I have been moving. My books and reference materials were packed in boxes (along with research notes) so I haven’t had the access or time to write (or think about what I wanted to write). I have been head-to-toe in paint for most of the summer. I have squeezed more boxes into my tiny car than was probably recommended and carried them in 90-degree heat. BUT, now everything has been placed. I even have a writing loft, full of paraphernalia from Narnia and Lord of the Rings, with a reading corner featuring Wonder Woman and Doctor Who. Yes, my nerd flag is raised and billowing proudly in the breeze. We love our new house, but I am fairly certain that I am never moving again! Thanks in part to the Lewis and Women series I did on the blog a couple of years ago, I was asked to contribute to a wonderful collection of reflections on Lewis and Women for a book commissioned by the C.S Lewis Foundation. This work includes a stellar list of Lewis folks and is edited by Carolyn Curtis and Mary Pomroy Key. Some of the contributors include Monika Hilder, Michael Ward, Devon Brown, Don W. King, Alister McGrath, Kathy Keller (wife of Tim Keller and child correspondent of Lewis), Brent McCracken, Randy Alcorn, Holly Ordway, Kelly Belmonte, Andrew Lazo, Malcolm Guite, Steven Elmore, David C. and Crystal Downing, Colin Duriez, Jeanette Sears, Lyle W. Dorsett, John Stonestreet, Joy Jordan-Lake, Mary Poplin, Kasey Macsenti, Christin Ditchfield, Paul McCuster, and Paul Davis. Last summer, I traveled to the Wade Center in Wheaton, Illinois and conducted research for a couple of projects (more on that coming up). While there, I did some extensive research on Flora Lewis, mother of C.S. Lewis. 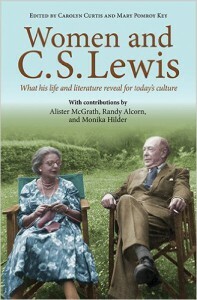 I was assigned the first chapter of the book, exploring how Flora influenced Lewis intellectually and spiritually. The book released on August 1. Words cannot express how excited and grateful I am to be included in such wonderful company. Make sure to pick up your copy here! Also, don’t forget to pick up my e-book Thirty Days with C.S. Lewis: A Women’s Devotional if you haven’t yet. I began attending Foundation events in 2012 and it has been a fantastic (and spiritually satisfying) experience. Tucked away from the busy Houston traffic, Camp Allen provides a quiet, contemplative environment to think, read, write, learn, fellowship, and grow. I blogged about my first experience here. The Retreat offers tracks for Writers and Readers, as well as a list of prodigious speakers/authors/writers (Madeleine L’Engle was a past guest!!). This year, the theme is “Of This and Other Worlds: C.S. Lewis and the Call of Deep Heaven.” We will explore Lewis’s Space Trilogy which is an important (and often undiscovered) portion of his fictional works. I will be teaching courses for attendees, and also serve on a panel for the Women and C.S. Lewis book. I am thrilled to be a staff member this year. If you wish to attend (and you should! ), visit the Foundation’s website for registration. I’m going back to school. Yes, I already have a doctorate. Yes I know I’m crazy. The M.F.A. is a degree that I have secretly wanted for years. I currently teach three sections of Creative Writing at the high school. The program has grown from nine students to nearly sixty this year. I feel immensely blessed to teach this every year, and it absolutely warms my heart to see students excited about writing. One of my first students attended the Young Writers Workshop at the University of Iowa and is currently now a student there. Iowa has the best Creative Writing department in the country (graduates include Kurt Vonnegut, Flannery O’Connor, and a bunch of other cool people). My student has been selected the last two semesters to attend the fiction workshop, a class for which only fifteen students are chosen. I am BEYOND proud of him. Usually we catch up on writing projects when he is in town. Last Christmas, he came in for break and we grabbed coffee at Dunkin Doughnuts. He inquired about a draft for a novel I was considering. I told him that I had a page and I thought the idea was all rot. He encouraged me to write and send him drafts to keep me accountable, then the conversation turned to an M.F.A. I admitted that I wanted to go back to school, but I thought I was too old to pursue it and that the degree wasn’t “practical.” First, he vehemently disagreed about hesitation with my age, and secondly, he strongly urged me to apply. So I took his advice. I gathered together some of my best poetry, crafted a letter of interest, and applied to two schools: Sewanee and UTEP. I was incredibly nervous to send it out. I feared rejection. I prayed fervently for God’s direction. Then I waited. Within a few weeks, I was accepted into both programs! I was surprised, relieved, and thankful, but now I had a hard choice ahead of me. Sewanee is an excellent program, but requires a move to campus for six weeks every summer. Unfortunately, with all of the moving mess, that wasn’t possible. The UTEP program is completely online with an online residency workshops. This would allow me to pursue the degree without missing weeks of work. I was informed that only six were chosen for admission. I knew it was meant to be. This fall, I will begin taking courses. My goal is to sharpen my skills in both poetry and prose. I really want to write fiction. I enjoy writing nonfiction, but I cannot shake the impulse to compose fiction. I kept waiting for the desire to pass, but it was nagging and persistent. So, so, so persistent. As mentioned earlier, I went to the Wade last summer to conduct research on Lewis’s mother and father, Albert and Flora. While there, my friend and fellow Lewis scholar Dr. Charlie W. Starr was dating manuscripts. Charlie has extensively studied Lewis’s handwriting and can determine the date of manuscripts with impressive accuracy. While at the Wade, Charlie introduced me to an unpublished manuscript titled “Pudaita Pie: An Anthology” which chronicled (and numerated) the anecdotes or “wheezes” uttered by Albert and collected by his sons. It has been long believed that Lewis and his father had a strained relationship. This is perhaps true for a young, adolescent Lewis. However, time and experience softened Lewis’s early impressions of Albert. Both C.S. Lewis and his brother Warren scribbled remembrances of their father in a notebook, and nearly all of the entries were recorded while Albert was still alive. After obtaining permission from the C. S. Lewis Company, I am publishing this manuscript in the upcoming issue of VII: An Anglo-American Literary Review. I am conducting additional research on Albert for two upcoming projects. More on that soon! As usual, I am still writing for All Nine Muses and Legendarium. I also have forthcoming book reviews in Sehnsucht and Mythlore. It’s good to be back in the blogosphere!